Chowkidars, we are not stupid! This has got to be the most dumbed-down election ever. The other day, Twitter was awash with major political leaders all thumping their chests and insisting they were chowkidars. Chowkidars themselves are puzzled by how their profession has become so high-class and sought-after suddenly. They have been gathering at the bottom of the buildings in my colony, leaning on their lathis, and discussing if there is a pay rise in there for them, somewhere. But of course there is not. It is like last fortnight everybody was walking around in camouflage fatigues (including Virat Kohli and his merry crew) insisting they were faujis, but the faujis got nothing out of it. Nor did the chai-wallahs, a little while ago, when our PM was thumping his chest and proudly saying ki haan, main chaiwalla hoon. Anyway, I suspect #MainBhiChowkidar has been churned out in a hurry, in a blind panic actually, because the Congress’s chowkidar chor hai slogan has been gathering momentum. And also because the Modi hai toh mumkin hai (which is a shameless lift of the old Airtel Magic hai toh mumkin hai line, I wonder if they are considering suing) has created as much as a ripple as the new Pepsi commercial (none). The fast-talking marketing team has sold the panicked party some glib, twisted logic of ‘embracing a negative and turning it into a positive’ with the result that now Modi is now lumped with calling himself Chowkidar Narendra Modi, surely a sad comedown from Prime Minister Narendra Modi, and horribly reminiscent of the Insaan suffix that follows the names of all members of the Dera Sacha Sauda cult. 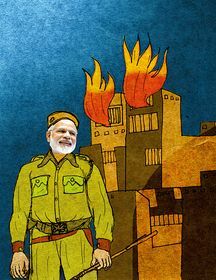 It is actually pretty funny, but also rather scary—as it begs the question that if everybody is standing outside, holding a lathi, smoking a beedi and guarding the building, then who the hell is inside the building doing the vital work of governance? There is contempt for education, skills and white-collar workers in the line. There is watchdog-ism in the line. There is khap-ism in the line. You get the sense that the country has tuned into a Big Boss set, and there are surveillance cameras everywhere—watching you narrowly. And of course, there is the point that if indeed Modi is a chowkidar, then he is a pretty lousy one. Vijay Mallya, Nirav Modi, Mehul Choksi have all happily run out of the country on his watch, and he has done absolutely zip about getting them back. He has not been very good at guarding the institutions of democracy either—the Supreme Court, the CBI, the RBI, and the Constitution of India itself, have all been messed with and compromised in various ways on his watch. Crimes against women have been on a rampant rise as well—so no kudos for his chowkidari in that department either. The only thing he has been successful at, is a certain regressive, sternly paternalistic sort of moral policing. So the BJP’s usage of this particular line strays beyond irony into absolute dishonesty. Supporters of the BJP may say in his defence that at least he has a campaign in place. There is a film and a line and it is all rolling out on time. The Congress, on the other hand, still remains absolutely mum about their slogan, campaign and manifesto for elections 2019. Which, of course, is really quite unforgivable. They should have been out there, united, alliances in place, firing from all cylinders by now. I mean, do they want to win or not? Seriously, what gives? But I would say the BJP is worse. Because while the Congress’s lethargy and silence can (and should) be considered stupid, the BJP’s campaign reveals something much much worse. It reveals that the self-styled pseudo-chowkidars in the BJP think that we, the voters, are stupid.